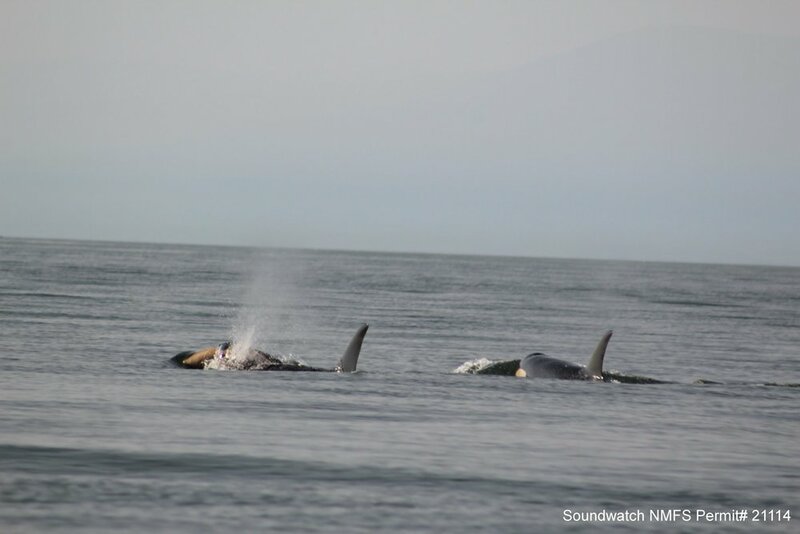 For the last nine days, a female Southern Resident Killer Whale has been carrying her dead calf around the Salish Sea. J35 is certainly expending energy. She’s a member of our resident fish-eating orca pods that are under great nutritional stress from lack of salmon, but still, according to data collected by The Whale Museum's Soundwatch program, she has carried her dead calf at least 250 miles since its death. (View an interactive map of her daily travels). It was Ken Balcomb of the Center for Whale Research who first told me about epimeletic behavior. This is when a healthy animal cares for an injured, ill, or dead individual. At the time I couldn't imagine this behavior could extend to whales but in September 2010, 24-year-old Southern Resident L72 was seen carrying her dead newborn female calf on her nose and head for a day. The strength it takes for a killer whale to bear the weight of even a lifeless baby for a short time while battling currents and waves, and having to continually surface to breathe is remarkable. And J35 has been doing it for at least 9 days and 250 miles. Is it a coincidence that this behavior, which from the standpoint of a creature’s energy budget makes no sense, has been noted only in long-lived highly social cohesive animals like primates and several species of toothed whales (Risso’s dolphins, Indo-Pacific bottlenose dolphins, spinner dolphins, short-finned pilot whales, sperm whales, and Australian humpback dolphins)? I don't think so. Us humans are long-lived socially cohesive animals, and we exhibit the same epimeletic behaviors. We call caring for our sick “love” and we call the sadness we feel at the death of a loved one “mourning.” But scientifically speaking, can we really say what J35 is doing is mourning? For years scientists vigorously avoided using emotional terms like happy, sad, playful or angry when describing animal behavior. But as Carl Safina reminds us in his treatise on animal emotions, Beyond Words: What animals think and feel, if animals have the same brain, same hormones, and same neurotransmitters as we do, why wouldn't we expect them to have the same emotions? Are we, after all, so arrogant to think we have the market cornered on emotions even though other highly social animals have the same hard wiring? So, can we scientifically call J35's behavior mourning? Yes! Not only do I think we can call it mourning, I think we must call it mourning. J35’s relatives have been seen bringing her salmon to eat while she carries her dead baby, and I also don’t think we should be afraid to speak of those as acts of caring or love. Our feelings have the same physiological bases as the orcas', so we can and should use the same words. Calling J35's behavior “mourning” reminds us that these animals think and feel, just as we do. Losing a newborn leaves a hole in one's heart whether you’re a human or an orca. The only difference is that while we seem to be the masters of our own destiny, the long-term survival of the Southern Residents lies in our hands. The sight of J35 mourning her dead calf is a stark and dreadful memorial to the fact that we’ve allowed the Southern Resident population to fall to what is nearly its lowest point since the Center for Whale Research started monitoring it in 1976. Right now, citizens of the Salish Sea are faced with a decision: dramatically change how we think about and invest in ecosystem restoration or risk losing Southern Resident Killer Whales forever. Our scientific understanding of the Salish Sea and how it works tells us that we are long past the point of band-aid measures like increasing hatchery salmon or culling pinnipeds. Now is the time to maximize spending on restoring shorelines that support the food and habitat that salmon need so they can flourish and provide the orca with enough to eat. We must also reduce ocean noise that pervades the orcas’ feeding areas, and clean up the persistent toxic chemicals that we dumped in the ocean and now contaminate the whales we profess to love. Governor Inslee was right when he said that the lives of salmon, orca, and people are inextricably linked. Full-scale ecosystem restoration will save salmon, orcas, and us. It is time to go all out and take care of this place as if our lives and our livelihoods depend on it. Because they do.